Discussion in 'Pin Zaps & Swaps' started by MerlinEmrys, Apr 16, 2019 at 6:25 PM. In my sinus filled week and weekend, I've felt so blah that I haven't even opened mail until today. That's how gross I've felt. 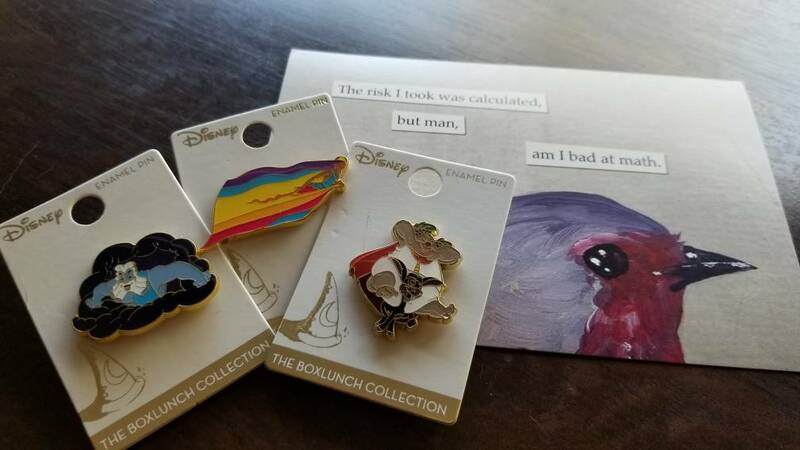 But today, I felt marginally human, so I cracked open some pin mail I had coming. Among them, and stop me if you've heard this one, was a package from @LittleBird I wasn't expecting. "Okay," says I, "Did I forget a trade?" Upon opening, I discover that no, I have not forgotten a trade, but Kim has forgotten her mind! As she zapped me three godly pins!!! And then Kim's all like," IMMA ZAP YOU!" and I'm all "WHAAAAA!?" ladyroselie, Kerri780, Ocean7 and 8 others like this. NyQuil is a helluva drug. Congrats on the zaps and lol at the postcard!! Congrats on the zap! Hope you feel back to 100% soon. Congrats! Please feel better soon! 10/10 for gif use. Great zap! Wonderful zap and great postcard. Congrats and feel better! Very nice zap but you gotta watch out for that girl.